My little girl had a great time attending Purdue Space Day this past Saturday. This was her first time attending the program and she had a blast. She has been seeing her big sister attend every year since 2012, so it was very special for her to finally attend. Purdue Space Day is a free annual event for 3rd -8th graders offered at Purdue University in West Lafayette, Indiana. However, space is limited and signing up with an online registration is required about a couple months before the event. It is a program that teaches STEM education through fun activities. 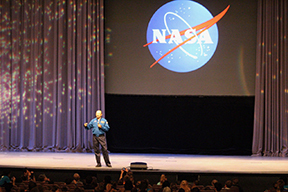 Saturday’s event started out by the presentation given by guest astronaut Mark Polansky. After the presentation, my little girl participated in the activities. The 3rd & 4th graders’ hands on activities were Egg Drop, Stomp Rockets and Life in Space. My little girl said that it was so much fun! When all the activities were complete, they ended the day with a group photo taken with astronaut Mark Polansky. When my husband checked out our little one from her class, we happened to see astronaut Mark Polansky walking back with his chaperone. My little girl ran up to him and simply asked him if she could take a picture with him. He smiled and said “Yes!” So sweet of him. How often do you get to take a picture with an astronaut?! The best of all is that he is a Purdue alum as well. Yes, we love Boilermakers! Beside attending Saturday’s event, my oldest one also had a wonderful time in the past 5 years attending Purdue Space Day. The most memorable astronauts she’s met in the past are Buzz Aldrin & Jerry Ross. My husband and I are so thankful for all the guest astronauts attending Purdue Space Day, the volunteers & the student volunteers for their hard work & for all of them becoming great role models for my daughters. My oldest’s has now set her future goals to attend Purdue (STEM field) and is hoping to volunteer for Purdue Space Day to give back. We can’t wait to see her accomplish her goals in the future. I highly recommend this program if you are looking for free educational things to do in the future. If you missed this year’s Purdue Space Day, there will always be next year. Make sure to keep an eye on Purdue Space Day’s webpage, Facebook, Twitter, Instagram for their updates. They usually post the online registration date a few months in advance. As soon as you find out the online registration date & time, mark your calendar, set your alarm so that you don’t miss out on it! This year the online registration was closed within 30 minutes! Yes, all the spots were gone in 30 minutes. This is a very popular event with limited space, so you need to be very quick to register your child / children. I wish you luck everyone! I hope your child or children has a chance to attend this wonderful program next year! For more detailed information about this program, please visit Purdue Space Day’s website or their social media links listed below. Previous Post My lunch today!